What Can (And Can’t) Be Recycled? 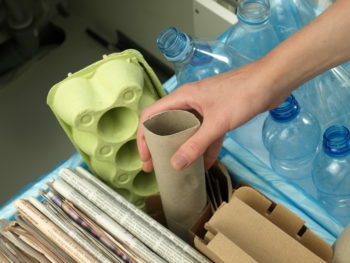 One of the easiest ways to be more eco-friendly is to recycle. It takes minimal effort, and it lets you make a big difference in terms of how much waste you produce. With that said, though, just because an item is made of plastic, or metal, that doesn’t mean you can just toss it into the recycling bin. So, before you just start tossing all that plastic, cardboard, and glass into your bin, listen to the advice from Waste Management. There are some definite items you can, and should, always recycle. Any metal food can, once washed, is perfectly acceptable. So, from cat food to soup, those are always a recyclable item. The same is true for aluminum cans, as long as they’re clean. Even aluminum foil, once you’ve wiped off the food residue, is perfectly acceptable. Glass bottles and jugs are also good candidates for recycling. Newspaper, magazines, printer paper, and junk mail can all be tossed in there without issue. Same for cereal boxes, cardboard, and even paper milk jugs, once they’ve been washed out. Food waste is one of the biggest contaminants when it comes to recycling, and it’s important to avoid it at all costs, as it can spoil entire batches. Plastic drinking bottles can be recycled as well, and pretty much anything made from PET plastic. We have the technology to recycle quite a lot of material. However, while many things are technically recyclable, you shouldn’t throw them in your bin. A good example is plastic shopping bags. They can lead to problems in many recycling facilities, which is why it’s important to return them to stores who have collection bins out for those bags specifically. Batteries are another good example because while they can be recycled, you need to make sure they’re put into a battery-specific collection bin instead of thrown into general recycling. Even electronics like old phones, televisions, etc. can be recycled, but you need to take them to an electronics recycling facility. For more information on how you can live a cleaner, greener lifestyle, simply contact us today!